It’s been 2 1/2 months since that first crochet lesson and I grow more fond of this yarn craft every day. Projects move quickly. It’s easy to unravel stitches, then redo them without getting confused. And best of all, it’s so versatile. The more I practice crocheting, the more inspired I am by all the possibilities. Last week, I decided to crochet these cute little Easter baskets for my boys and my niece. I am, once again, just using single crochet in the round, but I’ve added a few “special touches” to these little guys that make them different from that first project, the crocheted skullcap. Before I go on, I’m just going to throw in a sorry if what follows is not written in the standard language of crochet patterns. I’ll try to be clear. But, if you do need more details, please comment in with your question and I’ll answer as best as I can. Or better yet, stop in to Lion Brand Yarn Studio to ask my ever-so-clever crochet instructor, Edita, what to do next! About Edita. Remember I mentioned her in earlier post? She’s a gifted instructor with a passion for yarn. I love taking lessons with her. Each time we meet, I pelt her with a my ideas and questions. She then proceeds to demonstrate the answers (or applicable techniques) for me just as fast as I can throw my questions at her. So all my extras for the baskets actually belong to Edita. I described what I wanted and she taught me the skills I needed to make it happen. Thanks Edita! Now, onto actually making these baskets! Make a loop with the tail end of the yarn. Single crochet 6 times into the first chain. Close the round (using a slip stitch). Pull the tail tight to close the center hole. Chain 1, then single crochet 2 times into each of the 6 stitches. You will have 12 stitches at the end of this round. Close the round. Chain 1. Single crochet in every stitch but this time, increase every 2nd stitch (instead of in every stitch as we did on step 6). Once again, this results in adding 6 extra stitches uniformly about the round. You should have 18 stitches at the end of this round. Close the round. Repeat step 7, but this time, increase every 3rd stitch to get 24 stitches at the end of this round. Repeat step 7, but this time, increase every 4th stitch to get 30 stitches at the end of this round. Repeat step 7, but this time, increase every 5th stitch to get 36 stitches at the end of this round. Repeat step 7, but this time, increase every 6th stitch to get 42 stitches at the end of this round. This forms the base. My base measures just under 5 inches in diameter. NO more increasing. Back post single crochet the next round. This creates the “rim” about the base. Back post crochet just means to insert your hook about the “posts” instead of under the “v-stitch.” Insert back to front to back…. and if that made no sense, you can check out this back post single crochet tutorial on youtube. To create the basket wall, just go back to regular single crochet on each round. Remember to close each round and to start each round with a single crochet. I have a dreadful time recognizing the start of the round, so I use a split ring marker to mark where I chain up each round. Continue to single crochet the “walls” of the basket until the height is @ 3.5 inches high. Use tapestry needle to weave in yarn ends. For Simon and Ethan’s baskets, I simply added in one round of single crochet using a contrasting color. For my little four year old niece, I chose to do a picot edging for a frillier look. Super simple. Single crochet in each stitch of the round, but on every other stitch, chain 3 after that single crochet and then use a slip stitch to anchor the chain back to the single crochet (I attached back through the 1st chain and 1 of the single crochet strands). Once again, here’s a edging tutorial you can take a look at. Sew 2 buttons on the basket body (directly across from each other). To create the loop at the handle end, I chained 8 (you may want to do a few more or less depending on the size of your buttons), then closed the loop and started working a Romanian cord (cord tutorial here if you need it). When the cord reached the desired length (about 8 inches), I finished the handle by chaining another 8 and closing it to create the other loop. Finally, to add some structure to the handle, I cut a length of 19 gauge wire, used the pliers round off the ends by bending very small loops and threaded the wire through the hollow length of the handle. Wrap yarn ends between loop and cord, knot and then weave ends in. And that’s it. So the boys and I will be heading to San Francisco to visit my family over Easter. When I last saw my niece, Marina, I promised her we’d make princess crafts and play dough together on my next trip out to CA. I think this little basket is a good start to fulfilling my promise to her. Can’t hardly wait ’til Easter morning when I get to watch the kiddo’s hunting for Easter treasure with their little baskets in hand! I want to show you some of what I’ve been working on the past 2 months. As I mentioned before, I take an art class whenever I can fit one into my schedule. Most recently, I’ve been drawing live models for 2 hours a week with instructor, Enid, from the Battery Park Conservancy (BPC). But it’s worth it. I think the human figure is fascinating – in all its shapes and sizes. I so wish to be able to accurately capture it. I’m excited because I’ve made some real progress these last few weeks. Here’s how the class works. 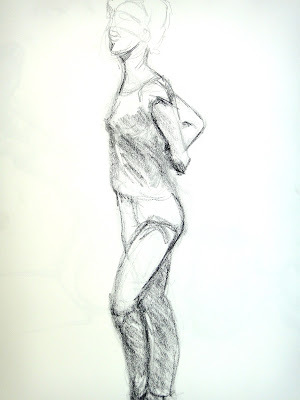 We warm up with ten 1 minute poses, then five 2 minute poses. Break. Four 5 minute poses. Break. Two 10 minute poses. Break. One long 20-30 minute pose. So 22 sketches by the end of each class. 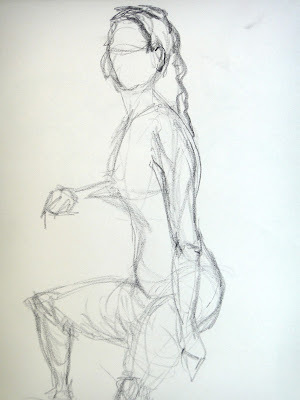 The class is about capturing the figure and how the parts of the body are in relation to each other. It’s not about drawing the perfect hand or all the details of the model’s face. I’ve picked a sketch from each class to share. Of course, every single drawing still has a lot of problems, but these are the ones that speak the most to me and call to mind each particular model. Week 1. First time back to drawing in over 6 months. I was feeling stiff and self conscious. Rebecca is long and lean. 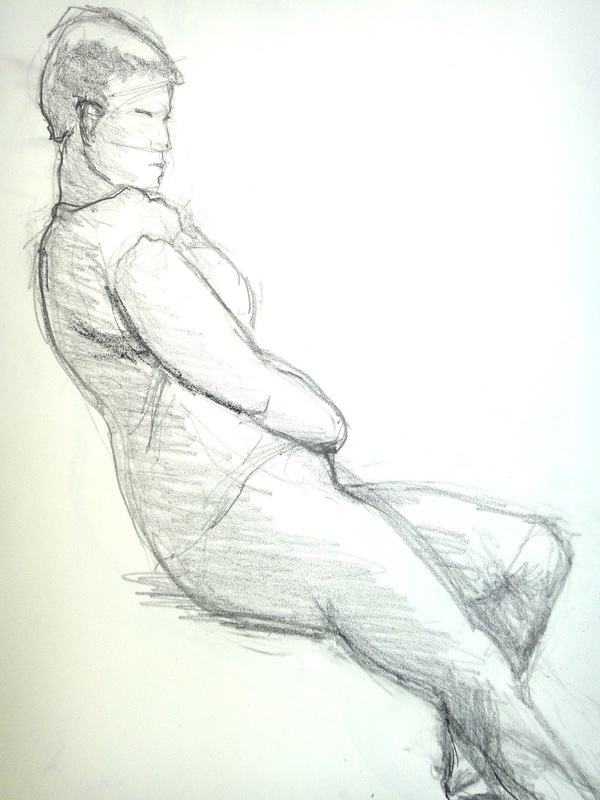 I struggled to capture her subtle curves and length without drawing a stick figure. Week 2. Donna is one of my favorite models. She has a steady, grounded, peaceful energy that emanates from her as she moves from pose to pose. Unfortunately, I don’t think my drawings this day do justice to her presence. One thing I did do right is to draw the turned out angles of her legs. Week 3. Tabitha. She was leaning on the wall. And I’m so pleased that she looks like she’s leaning on the wall. 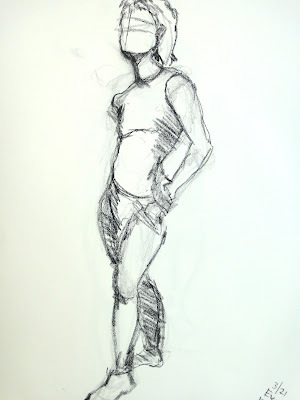 Enid suggests drawing the line of the back first; whenever I ignore her about this, I end up botching the whole figure. Note to self: Listen to Enid…. Week 4. I think this was one of my bigger-headache and extremely frustrated days. 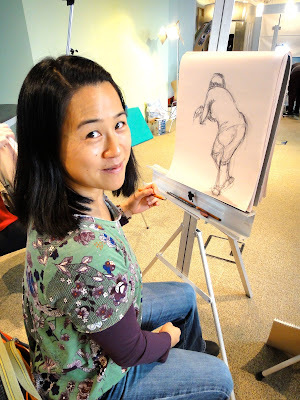 Here, I was battling my nemesis – foreshortening. One of Leticia’s legs was coming out towards me. I’m struggling with feeling her front leg and finding where her knee is. Blaugh. My head is starting to hurt looking at this picture. So I’ll move on. Week 5. I didn’t attend this class because I blew out my back and ended up flat on a heat pad for two days. Luckily, it was just two days. But one of my classmates told me I missed a good looking guy model…. bummer…. Week 6. A miserable drawing day. Pounding headache. Not to mention the model was part contortionist who favored standing on one leg. But I like the lines on this drawing. 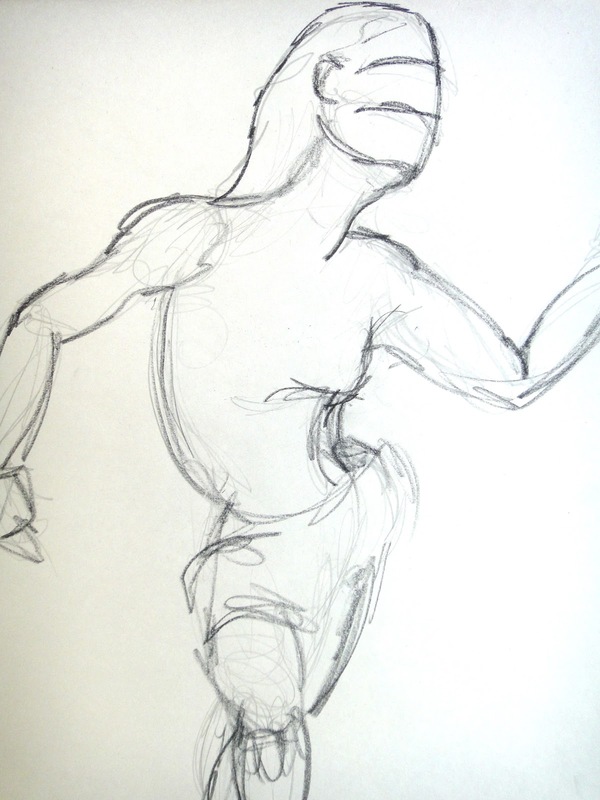 Sometimes my mind tries to stop my hand from drawing extreme curves, but here, the hand was faster and more accurate than the mind…. Week 7. A much better drawing day. Maybe it was the model… or the diet coke I downed before class… or perhaps, I’m improving. Drawing Marilyn felt right. And yes, her arms really were twisted behind her back like that. Week 8. A good day. I like the basic standing pose. I even had enough time to do some rough shading on her back leg. Interesting how even this bit of shading adds depth to the drawing. Week 9: I was delayed at the kids’ school today so I missed the first half hour of warm up sketches. Still, I had some success with John. This one is actually not my best effort of the day, but I like it because I absolutely relate to his slumped over pose of complete exhaustion. So that’s it. This nine week drawing session is finished. But the free summer programs offered by the BPC will be starting in May. Enid’s figure drawing class will resume outside in Battery Park on Wednesday afternoons throughout the summer. She’s a fantastic instructor working for an amazing program. I’ll be out there…. want to join me? I’ve been feeling like little Mary Lennox from “The Secret Garden” (by Frances Hodgson Burnett). My little guy, Ethan, is itching to get his hands in the soil too. The two of us have taken to haunting our local community garden. So many reasons to love living in NYC. But this is the one time a year I really miss living in a house with some yard around it. As E and I wander about the community garden, I tell him how much my dad loved to garden. I grew up surrounded by apple, cherry, plum and pear trees. Anywhere there was sufficient sunlight and earth, my dad would want to dig a hole and plant a fruit tree. Dad loved his trees so much he almost couldn’t bear for us to pluck the fruit off his trees…. But pick them we did. I remember munching on sun ripened Italian Prune plums and Granny Smith apples. The Italian Prunes were so plentiful, my brother harvested them and taught himself how to make fruit leather. Good times. 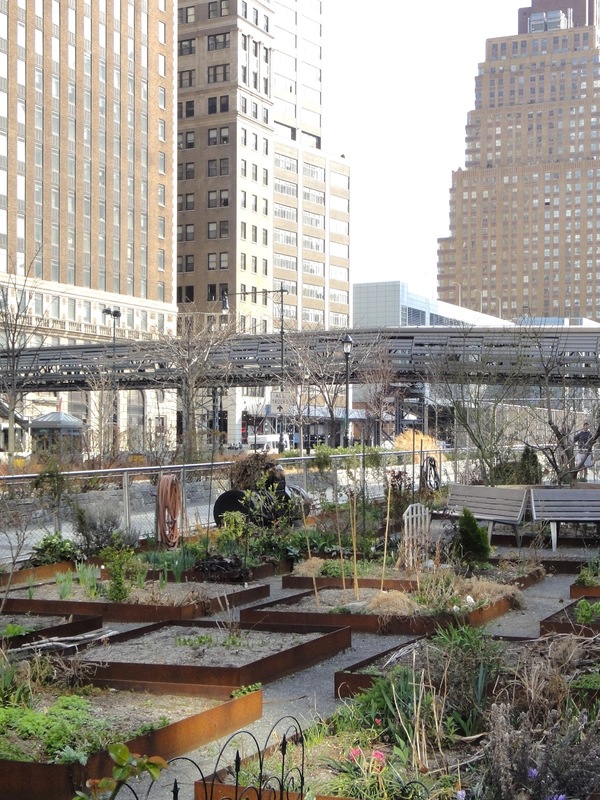 Well, even if we can’t plant here this year, we can still enjoy this wonderful garden. E and I crouch over different plots to investigate the new spring growth. We look at the crocus and daffodils and I point out the tulip leaves pushing up alongside the earliest spring flowers. 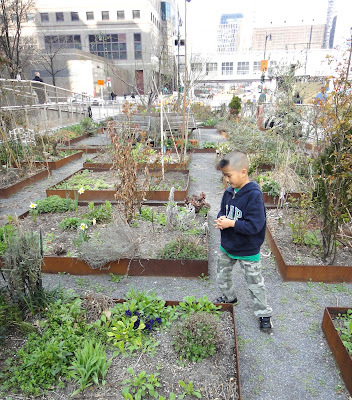 We’re not allowed to pick anything, but we go from plant to plant, rubbing the leaves and sniffing our fingers. We find spearmint, rosemary and lavender. We introduce ourselves to one of the community gardeners and watch her prune her rosebushes back. Exploring here only takes the edge off our craving to garden. Ethan turns to me and says when he grows up, he will buy a house with a big garden. And then he will invite me to his home to garden with him. Ethan agrees to it all. But he so longs to help out in the garden at that moment that he starts weeding the gravel paths. 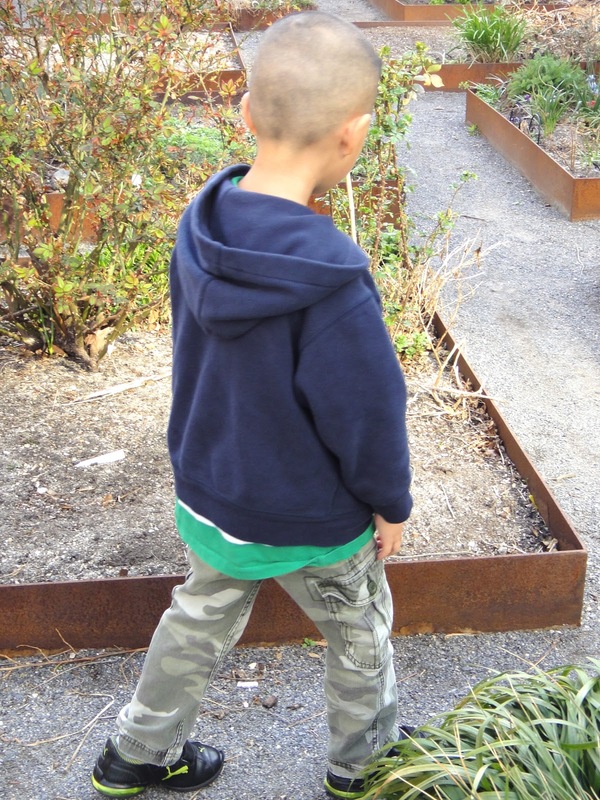 My heart twists a little as I watch him crouched over empty walkways pulling out bits of plant debris…. … Meanwhile, Ethan is delighted he’s pulled out the weed by its roots. He’s suddenly fascinated with the different parts of the plant. He carries his weed carefully home and painstakingly draws it in his “gardening journal.” As I color alongside him, I begin to make plans for how we will garden this spring. Visit SouleMama to join in on this nifty Friday ritual. Simon and I have been planning to make a custom chess set for the longest time. However, we kept pushing this project off. We couldn’t figure out what we wanted to use as our chess pieces. All of Ethan’s little plastic figures? Lego guys? What could we use to create a cohesive functional set? We revisited the idea repeatedly, but inspiration never really hit. Until two Friday’s ago. Right in the middle of frying sausages for breakfast. One second I was flipping sausages and thinking about what to pack the boys for lunch and the next second a vision of a chess set made from bits and pieces of “trash” popped up in my head. I kept seeing nuts and bolts in my mind. Seriously. All day. Nuts and bolts. And thread spools. Little wooden blocks. Legos too. Once the idea of using odds and ends to make our chess set took hold of me, it just wouldn’t let go. I impatiently waited for the school day to be over so I could spring this idea on Simon and Ethan. Both boys jumped all over the new plan. We immediately started scavenging around the house for possibilities. Ethan was the one who actually found the bits that comprised our inspiration piece. He wanted to help out with the Millie Project, so he joined me for my second visit to her place that very weekend (an update about Millie’s next time). The first task we set him to was to sort through a large bucket of …. you got it… nuts, bolts, washers, screws and other metal bits. He unearthed a set of stem glides that practically demanded to become the base for our chess pieces. We found enough metal bits to create our inspiration piece. Now our imaginations were really fired up. The direction for our chess set was decided. In the meantime, I had to figure out the chess board. 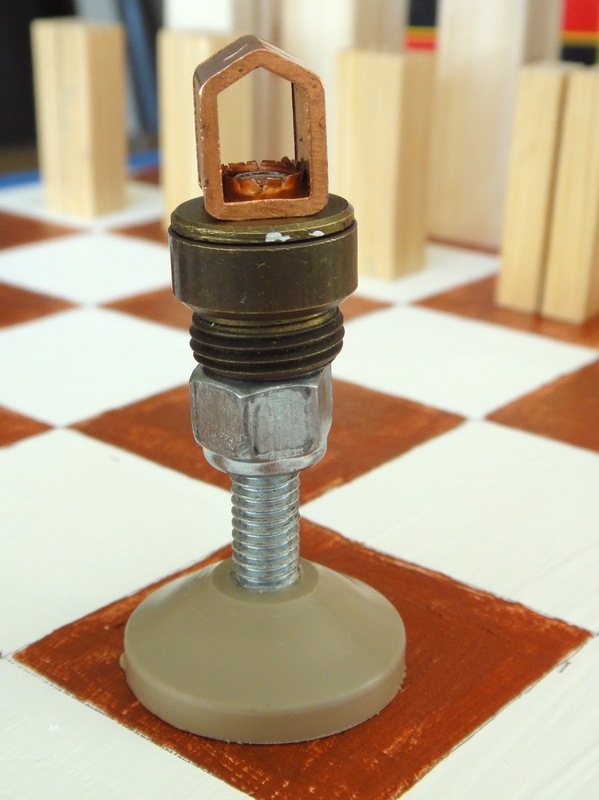 I wanted to start with a worn out piece of wood … something to complement nuts-and-bolts look of the metal chess pieces. I ended up painting our chess board on the beat up drawing board I’ve been hauling around for the past 30 years. So pleased I remembered I had it. It traveled with me from Idaho to California and finally to New York. It’s a total hunk of junk, but has sentimental value because my brother and I nailed our dad’s old suitcase case handle on it when I was 16. That handle traveled with my dad from Hong Kong to the U.S. over 55 years ago. I like thinking of it linking one generation to the next. Now my boys will use this same handle to carry their new chess board around. We marked everything out in pencil first. The painted part of the board is 16 inches by 16 inches. I had Simon figure out the math and measure the grid out. So we managed to fit a little math into our crafting session. One base layer of Gesso. Acrylic paint. Straight Iridescent Copper for the copper color. A mix of Iridescent Pearl, Cadmium Green and Cerulean Blue for that Statue of Liberty shade of green. I worked one color first & waited for it to dry before laying in the second color. Ok, I have to admit. I cheated a little. We didn’t have the patience to keep scavenging for the right sized pieces to complete “team metal.” I actually made a trip to the hardware store to look for more nuts, washers and caps. I ended up spending $25 for additional metal bits to finish off the first 16 chess pieces. But I put my foot down over the other 16 pieces. They had to come entirely from what we could scavenge. We asked friends to sort through their junk bins for miscellaneous toy trash – any kind of orphan bits that were destined for the trash. After sorting through all kinds of stuff, including plastic caps, random Dora-the-Explorer dominoes and mini wooden blocks, we decided we could make something from the blocks. Grey for the rooks. Rooks. Castles. Stone. Grey. Red for the bishops. I kept visualizing the cardinals from the Vatican decked out in crimson…. not sure what Simon was thinking, but he agreed red was the appropriate color. Purple for the King. Purple; the color of royalty. A bit of everything (except for the knight’s green) for the Queen. Yellow for the pawns. No real reason except this color complemented our other choices but didn’t stand out too much. Our first upcycled trash-to-chess set was complete. Did you notice I said first chess set? First … because our personal set may be finished, but the project continues on. I’ll be working with the third graders at Si’s school to create two more chess sets to auction off at our upcoming spring fundraiser. Before we can start constructing the two chess sets, we need to go scavenging once again. About 50 third graders and I had a big talk about the types of “trash” they should be looking for at home. I’ve got my fingers crossed that they are diligently following through on this. In the meantime, I’m also scavenging for possible parts. Can you help me? For my NYC friends & fellow parents at our school- Any chance you can take a look through your junk drawers & kids’ toy bins? If you are ready to part with any of the following bits and pieces, we will be happy to take them off you hands. Our class projects must be ready for auction within a month (mid-April). Anything you can send our way by the end of March would be much appreciated. I’m excited about our trash-to-chess set projects. It’s always great fun to make things. And the environmentalist part of me is happy because we’re using stuff destined for the dumps…. …A huge wild card has been thrown in now that 50+ creative kids will be making alongside me… but really, this is what can make the finished product that much more amazing. I can hardly wait to see what we’ll gather and what we’ll create.